Just when one thought that Nokia will launch even more products in its Nokia X family running Android or new Lumia devices based on Windows Phone 8.1, April Fools' Day comes and Nokia announces its heritage 3310 in a new avatar. The Nokia 3310, which was initially launched in 2000 and is one of the most successful phones ever released by Nokia, has made a modern-day comeback. The Finnish giant has introduced its 3310 sporting a 41-megapixel PureView sensor with Zeiss optics and Xenon flash. Further, the 3310 is seen boasting a huge camera hump at the back panel, much like Nokia 808 PureView and Nokia Lumia 1020. The company claims that the Nokia 3310 now runs a modified version of Windows 8 (yes, you heard it right) with a new 'ClearDiamond' 3-inch WXGA (768x1280) display. 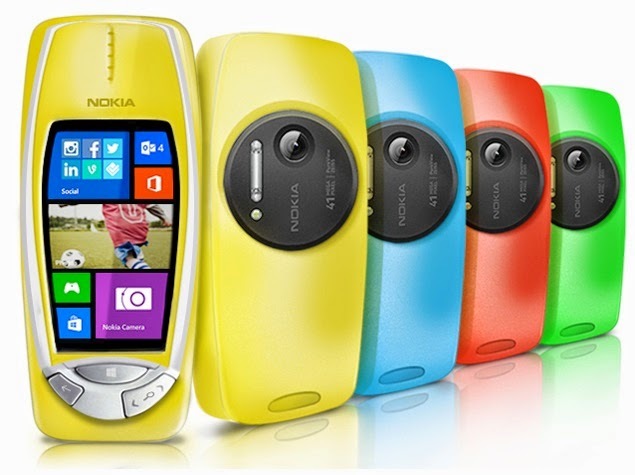 The Nokia 3310 PureView will be available in Blue, Dark Blue, Green, Red and Yellow colour variants. The revamped Nokia 3310 is a touchscreen device and also sports three soft-touch navigation buttons, alongside a Windows Phone 'home' button. Other specifications of the Nokia 3310 include a 1.5GHz dual-core processor; 2GB of RAM; 1430mAh battery; 32GB inbuilt storage; Bluetooth 4.0; Wi-Fi and 3G. The yesteryear device Nokia 3310 comes with pre-loaded with four games - Snake II, Pairs II, Space Impact and Bantumi. Other pre-installed apps include MS Office, Xbox Games, Outlook and OneDrive. Nokia notes that the Nokia 3310 will be rolled out with 3G connectivity, while LTE-enabled devices will follow later this year. Commenting on the Juha Alakarhu, Nokia's Head of Imaging Technologies said, "I'm really excited that we've found a way to marry our innovative PureView technology with such a beloved device. With its durable design and iconic look, we think even more people will enjoy our signature PureView magic." Earlier on Tuesday, HTC and Samsung both showed off smart-gloves on April Fools' Day. Samsung hit the hammer first, announcing its first 'all-over-hand' wearable device dubbed Samsung Fingers that features a flexible Super Emo-LED for the technology-sensitive consumer. HTC on the other hand teased its HTC Gluuv, which is also a smart-glove. Google, despite being one of the biggest tech companies showed off its unique sense of humour and that's most apparent on April 1 every year. The Mountain View giant has a long list of gags that include Google Pokemon Maps, Gmail Shelfie, Emoji Translate in Chrome, Auto Awesome Photobombs, Google Magic Hand, Nest Total Temperature Contro and WazeDates.